Even in its early days, Mayo Clinic leaders sought the latest and greatest technology and tools to help patients. That includes the most up-to-date medical transportation. In the late 1800s, the fastest way to transport patients was, as you can imagine, quite a bit different than it is today. But at Bellevue Hospital in New York City, patients had begun arriving by the country's first civilian ambulance. "When an accident occurs in any part of the city, there is a dispatch sent from the police … and the ambulance is on the ground in a few minutes after. The injured are picked up, and at once taken to the hospital. Truly this is quite as astonishing as any of the fairy tales." "He compared the ambulance to Aladdin's magic carpet," Matt Dacy tells us. Dacy, director of Mayo Clinic Heritage Hall, says that in 1905, Dr. Mayo's sons — Dr. Will and Dr. Charlie Mayo — purchased a state-of-the art "magic carpet" of their own to transport patients to their offices and affiliated hospitals. Like the one their father had seen, this ambulance also had some serious horsepower. (As in, it was powered by horses.) "That vehicle traveled up and down the streets of Rochester many times," Dacy says. A decade later, it was replaced by Mayo's first motor-powered ambulance: a 1912 Packard, donated by E. Starr Judd, M.D., the Mayo brothers' first surgical partner. "Technology is always changing, but in every generation Mayo has used the latest and greatest to care for its patients," Dacy says. "The evolving story of medical transportation is one example of how we do that." 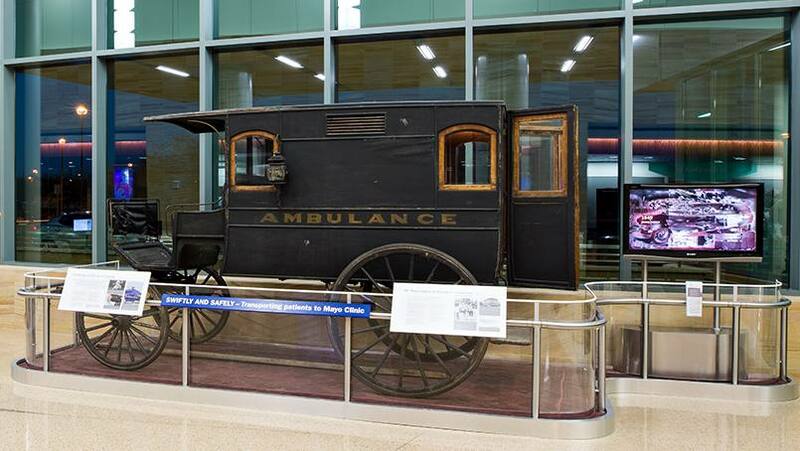 As a symbol of that historic commitment, that original ambulance — a gift from the Mayo family — was on display for many years in Mathews Grand Lobby on Mayo Clinic's Rochester campus. But this fall, it hit the road (so to speak) and was transported to be displayed on Mayo Clinic's Arizona campus. On this trip, the ambulance itself was the precious cargo. Sharon Erdman, of Mayo's Facilities Department, tells us it took a virtual village to move the vehicle. Staff from the W. Bruce Fye Center for the History of Medicine provided information on "curatorial requirements" for the historic (and fragile) piece. Staff from Facilities provided exhibit planning and project management. And the Mayo Cabinet Shop built custom shipping containers to house the ambulance on its journey westward. "It's been inspiring to see how patients and staff relate to the ambulance," Erdman says, adding that it gives people "a sense of 'grounding' that Mayo Clinic has provided help and hope to people for many generations." Todd Brown, director of Project Planning and Design in Arizona, seconds those emotions. The ambulance is "truly a centerpiece for the clinic building," he says, "and a rich tie back to Mayo's long heritage." If you're in Phoenix, stop by Mayo Clinic for an up-close-and-personal look at the ambulance. Those further on up the road can see the ambulance (and its successors) in this video timeline. Then be sure to leave us a comment below before you use the social media tools atop this page to share this story with others.